Firedrake provides several utility functions for the creation of semi-structured meshes from an unstructured base mesh. Firedrake also provides a wide range of finite element spaces, both simple and sophisticated, for use with such meshes. These meshes may be particularly appropriate when carrying out simulations on high aspect ratio domains. More mundanely, they allow a two-dimensional mesh to be built from square or rectangular cells. The partial structure can be exploited to give performance advantages when iterating over the mesh, relative to a fully unstructured traversal of the same mesh. Firedrake exploits these benefits when extruded meshes are used. 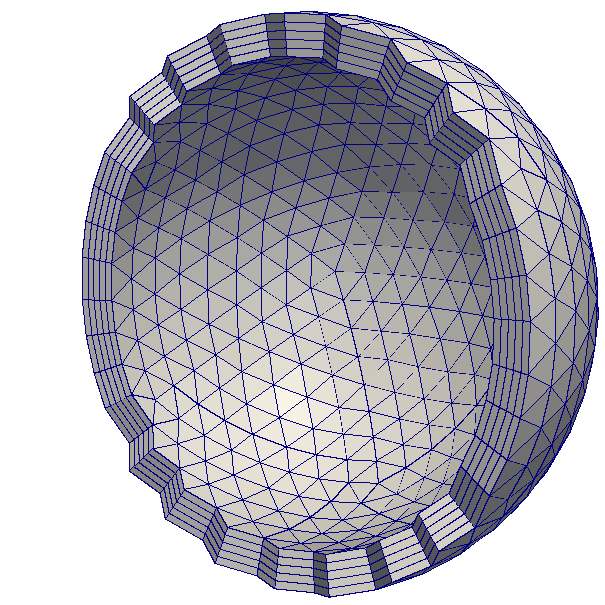 Structured and unstructured meshes differ in the way the topology of the mesh is specified. In a fully structured mesh, the array indices of mesh entities can be computed directly. For example, given the index of the current cell, the indices of the cell’s vertices can be computed using a simple mathematical expression. This means that data can be directly addressed, using expressions of the form A[i]. In a fully unstructured mesh, there is no simple relation between the indices of different mesh entities. Instead, the relationships have to be explicitly stored. For example, given the index of the current cell, the indices of the cell’s vertices can only be found by looking up the information in a separate array. It follows that data must be indirectly addressed, using expressions of the form A[B[i]]. Memory access latency makes indirect addressing more expensive than direct addressing: it is usually more efficient to compute the array index directly than to look it up from memory. The characteristics of a semi-structured or extruded mesh lie somewhere between the two extremes above. An extruded mesh has an unstructured base mesh. Each cell of the base mesh corresponds to a column of cells in the extruded mesh. Visiting the first cell in each column requires indirect addressing. However, visiting subsequent cells in the column can be done using direct addressing. As the number of cells in the column increases, the performance should approach that of a fully structured mesh. Extruded meshes are built using ExtrudedMesh(). There are several built-in extrusion types that generate commonly-used extruded meshes. To create a more complicated extruded mesh, one can either pass a hand-written kernel to ExtrudedMesh(), or one can use a built-in extrusion type and modify the coordinate field afterwards. 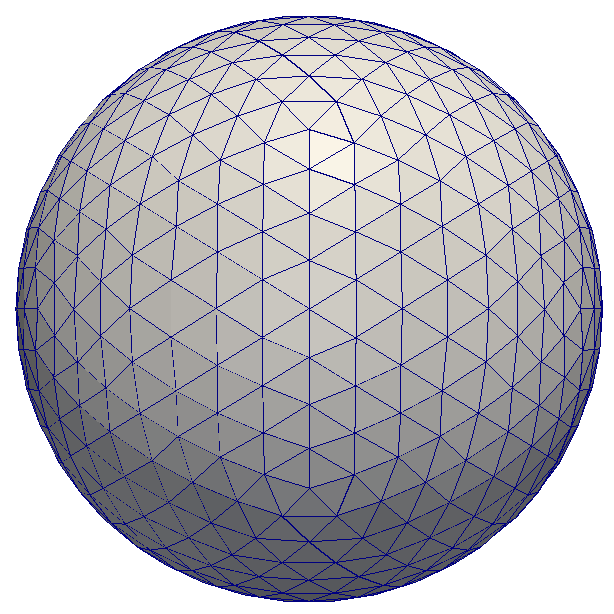 a Mesh object, which will be used as the base mesh. the desired number of cell layers in the extruded mesh. One may also specify layers per column, see below for more information. the extrusion_type, which can be one of the built-in “uniform”, “radial” or “radial_hedgehog” – these are described below – or “custom”. If this argument is omitted, the “uniform” extrusion type will be used. the layer_height, which is needed for the built-in extrusion types. 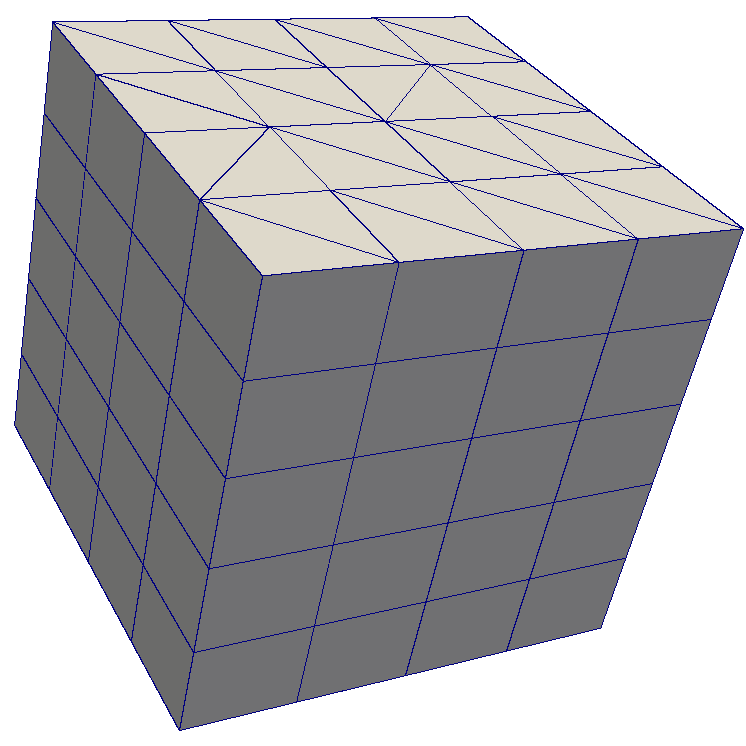 the appropriate gdim, describing the geometric dimension of the mesh, only if the custom extrusion type is used. Uniform extrusion adds another spatial dimension to the mesh. For example, a 2D base mesh becomes a 3D extruded mesh. The coordinates of the extruded mesh are computed on the assumption that the layers are evenly spaced (hence the word ‘uniform’). The base mesh and extruded mesh are shown below. The base mesh and part of the extruded mesh are shown below. Hedgehog extrusion is similar to radial extrusion, but the cells are extruded outwards in a direction normal to the base cell. This produces a discontinuous coordinate field. The 2D and 3D hedgehog-extruded meshes are shown below. For a more complicated extruded mesh, a custom kernel can be given by the user. Since this is a mesh-wide operation, a PyOP2 parallel loop is constructed by Firedrake. The simplest method of creating an extruded mesh is to provide a constant number of cell layers for every cell in the base mesh. For some applications, this may not provide sufficient flexibility. Firedrake therefore also allows creation of extruded meshes with a different number of cells in each cell column. To do this, we provide an array with two values for each cell in the mesh. The first entry is the number cells offset from the “bottom” (zero) level, the second is the number of cells in the column. To simplify the implementation, we never iterate over the interior facets that only have cells on one side. 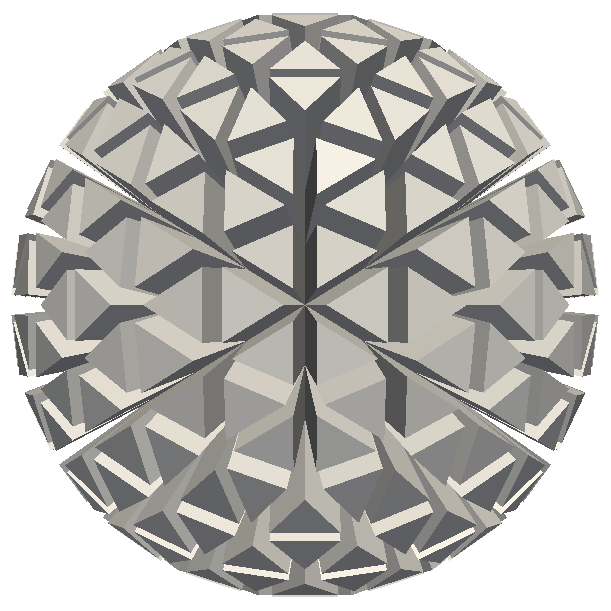 When you construct the mesh, you should arrange that these facets have zero area, by squashing the coordinates together. In addition, we require that the resulting extruded mesh does not contain topologically disconnected columns: offset cells must, at least, share a vertex with some other cell. When running in parallel, the base mesh will be distributed before the extruded mesh is created. So you should arrange that the layers array that you provide is specified accordingly (matching the parallel distribution). For more details on the implementation, see firedrake.extrusion_numbering. where element is a UFL FiniteElement object. This requires generation and manipulation of FiniteElement objects. Geometrically, an extruded mesh cell is the product of a base, “horizontal”, cell with a “vertical” interval. The construction of function spaces on extruded meshes makes use of this. Firedrake supports all function spaces whose local element can be expressed as the product of an element defined on the base cell with an element defined on an interval. We will now introduce the new operators which act on FiniteElement objects. will give a continuous, scalar-valued function space. The resulting space contains functions which vary linearly in the horizontal direction and linearly in the vertical direction. will give a function space which is continuous between cells in a column, but discontinuous between horizontally-neighbouring cells. In addition, the function may vary piecewise-quadratically in the vertical direction, but is piecewise constant horizontally. For moderately complicated vector-valued elements, TensorProductElement does not give enough information to unambiguously produce the desired space. 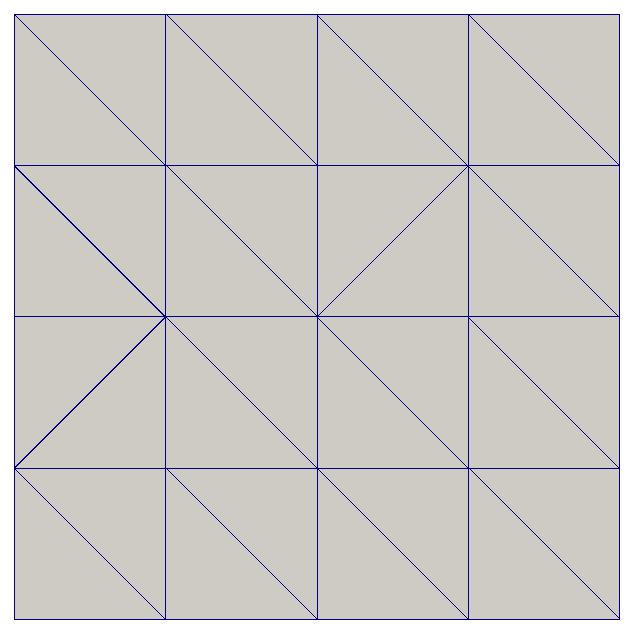 As an example, consider the lowest-order Raviart-Thomas element on a quadrilateral. The degrees of freedom live on the facets, and consist of a single evaluation of the component of the vector field normal to each facet. Once the mesh and function spaces have been declared, extruded meshes behave almost identically to normal meshes. However, there are some small differences, which are listed below. ds_v is used to denote an integral over side facets of the mesh. This can be combined with boundary markers from the base mesh, such as ds_v(1). ds_t is used to denote an integral over the top surface of the mesh. ds_b is used to denote an integral over the bottom surface of the mesh. 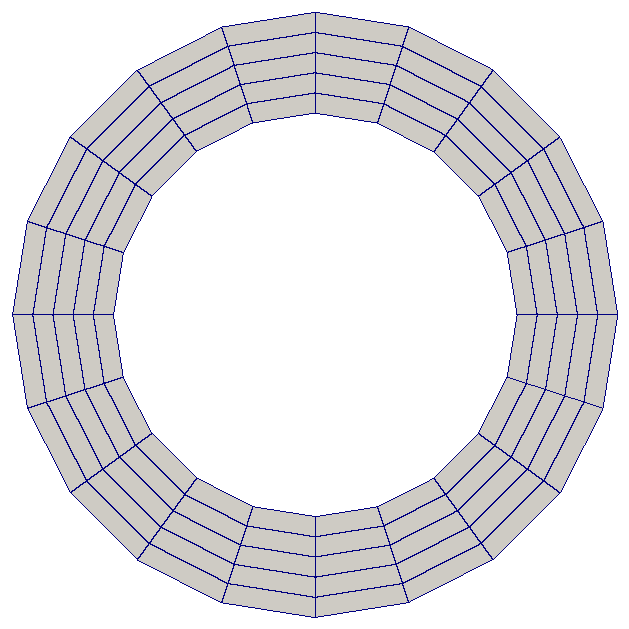 ds_tb is used to denote an integral over both the top and bottom surfaces of the mesh. dS_h is used to denote an integral over horizontal interior facets (between cells that are vertically-adjacent). dS_v is used to denote an integral over vertical interior facets (between cells that are horizontally-adjacent). 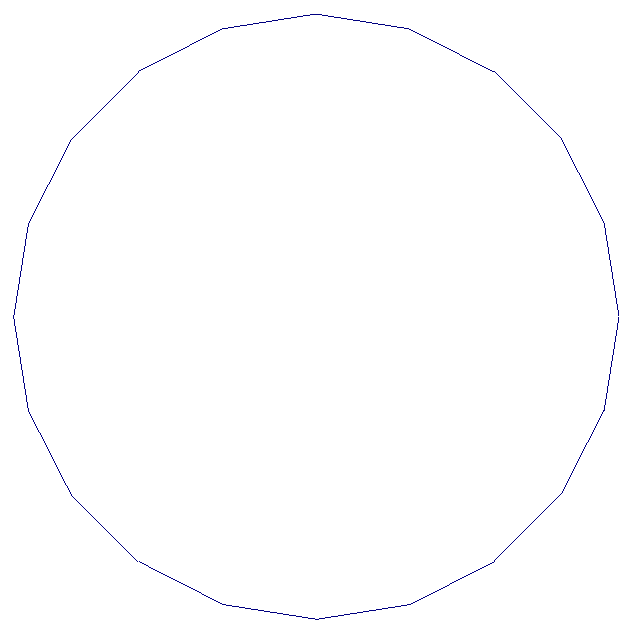 top, to set a boundary condition on the top surface. bottom, to set a boundary condition on the bottom surface.